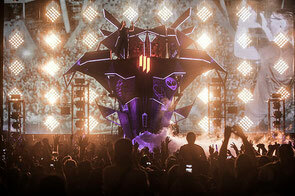 In Lets Make a Spaceship: Skrillex Mothership Tour 2014, a new 35-minute documentary produced by Red Bull Media House, six-time Grammy Award Winner Skrillex gives fans unprecedented access to go behind the scenes as he works with his team to create the most ambitious live show of his career. Lets Make a Spaceship takes viewers on a journey through the challenging and sometimes comical moments that went into building the live show and the 25-foot high dynamic spaceship that is its centerpiece. Since its debut at Coachella this spring, the Mothership continues to tour between massive festivals, open-air venues and smaller theatres throughout the US. Lets Make a Spaceship premiered immediately following Skrillexs headline performance during Weekend Two of the ACL Festival Livestream on 11 October on Red Bull TV. Red Bull TV is available on Android and iOS apps, and also as a pre-installed channel on Samsung Smart TVs and Apple TV. You can also get it as a free, downloadable app on Amazon Fire TV, Kindle Fire and Xbox 360 devices.